The World is an award-winning radio show co-produced by the BBC world service & WGBH Boston that covers world news, culture and music. The World's radio program reached partnered with 300 stations across the U.S. and reached about 2 million listeners every week. The World's website, however was a completely different story attracting fewer than 2 million unique users in a year! This lackadaisical performance was because the web content was not optimally organized and the overall user experience was very poor. The World is a non-profit organization and its lack of strategy and design efforts in the digital space not only limited its growth to a wider audience but also subsequently impacted its ability to generate more revenue. I started working on the project in early 2011 and working within the limitations of the existing platform and its building blocks, I launched the redesigned website in 2012. The improvements offered remarkable growth and within a year of its launch (summer 2012 - summer 2013) we saw a 3 times increase in its traffic - from 2 million to 6 million. 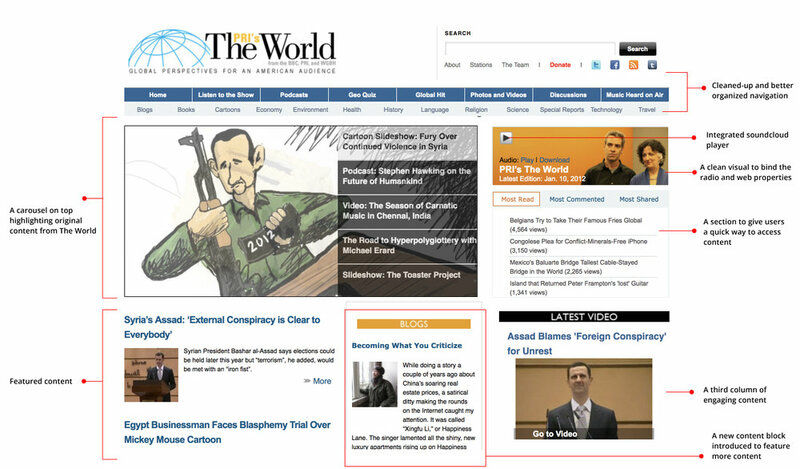 When I joined The World in fall 2010, The World’s website had poorly-organized content, little original reporting, hidden subscription button and random placement of banner ads and links. Moreover, an embedded flash player made the experience even poorer because of browser and OS compatibility issues. The poor web experience created a huge divide between radio and web traffic and was a lost opportunity for the show in the digital landscape. I proposed a redesign of the website to tap a web audience that could potentially open untapped revenue options for the company. But budgetary concerns made a full redesign impossible. A major funding was expected to come through in a year's time, which is when redesign could be considered a viable option. But waiting for another year meant missing continuing to provide an unsatisfactory web experience to our users. So I took the initiative of working on improving the user experience of the website, while working on other newsroom projects. Instead of a full redesign, I decided to focus on the content strategy and designing and building a better user experience of the home page and select category pages. Since the newsroom was built on a radio-first mentality, my first challenge was to bring everyone together and get them to think about business goals for the website. I led the brainstorm session by presenting some goals to the team based on my research and then asked everyone to rank goals prioritizing the top 3 goals by cumulative ranking for our design process. With the redesign goals set, defining the target audience for the website was the next tricky step. Over the years, based on ample demographics data collected from partner stations, the newsroom knew who its radio audience was: a 55+ middle-income Caucasian man. To understand the web audience, I needed to perform a proper audience research, but budgetary restrictions ruled that out. So, I became scrappy and worked with other designers at WGBH (The World's team sat inside WGBH's office space) to help me with the process. Together we conducted interviews, surveys and created profile outlines of potential users. With regular feedback from The World's editors and substantial help from the WGBH design team, I was able to create a bulls-eye persona for the website. Creating a viable content strategy for the target audience was the next step. Also, to promote user engagement, I decided to integrate Facebook and Twitter on every page allowing for users to share the content. For the homepage, I wanted to showcase all the stories aired on the show. To make the homepage look current, I also wanted to introduce original content, exclusive to the web experience. I proposed that our team of reporters and freelancers write blog posts, produce videos, slideshows etc. that could feature as part of our web-exclusive content. I also suggested that our radio producers create web-exclusive audio snippets from unused or long interviews that could feature as original stand-alone content. To accommodate all this exclusive web content, the UX design had to be considerably modified. I restructured the home page creating buckets for features, interviews, blogs and giving space for stories that featured slideshows, videos or other web-exclusive multimedia packages. The navigation bar was cleaned-up to include categories that featured regularly tagged content and were arranged alphabetically for easy navigation. I also introduced a content carousel on top that would feature web features or multimedia-rich stories picked by our editors. Lastly, I introduced a banner on top that would alert users about Breaking News or important alerts, if needed. Since budget constraints prohibited a wireframe testing, I presented the redesigned homepage and story page wireframes to the newsroom and executives. While everybody liked the potential changes, there was hesitation from some folks in the newsroom about doing the extra work for web. I, along with the senior management team, argued the benefits of content discoverability to the team and the need to have a substantial digital presence in order to stay competitive with our peers and the impact a good digital experience could have on our overall brand growth. We also emphasized the need for everyone in the newsroom to contribute to a strong digital experience for our users. It was finally decided that the digital team will initially share the web workload and eventually train editors and reporters to create web content as suggested. A few months later, with most of the implementation done, I put the design to test. I created two separate test groups: The first one was a selection of users from The World's newsroom staff that closely matched our target user. The second was a group of target users selected through my partnership with the WGBH design team. Putting the new live mock-up to test against the existing site, I wanted to compare the design experiences of these two user groups. Since one user group was more used to the radio environment and the other was not, I wanted to stress test my design to see if it works for a user who doesn't know about the radio show. Users in both test groups found the homepage current and organized and were less distracted by external links and banner ads. 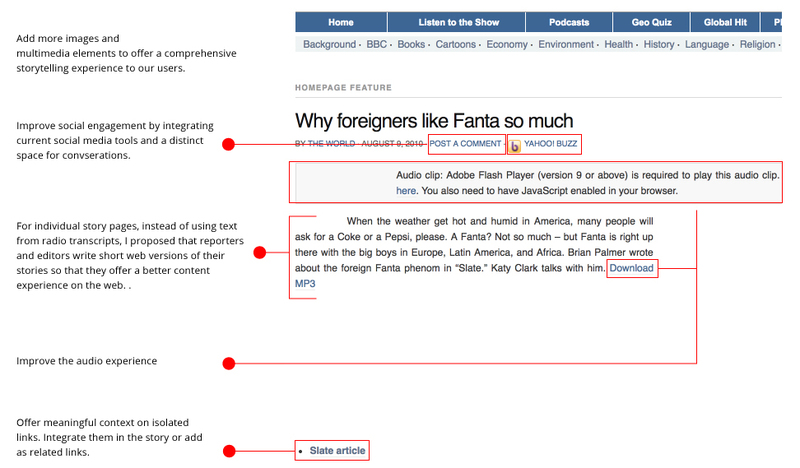 On story pages, they spent more time reading the story and found the experience at par with other digital publications. The testing however revealed one critical pain-point: audio experience. Both test groups felt that the flash player was a sore point in their overall web experience. It was obvious to me that audio was critical to The World's digital identity and no redesign could ever be complete if the listening experience was not improved. I wanted a player that offered a great audio experience, was not bulky, worked optimally across browsers and devices and did not overload the production process. I looked at several plugins to replace the existing player, but none checked all the boxes. It was around this time that we came across a new audio platform - Soundcloud. Soundcloud offered a great audio experience, options to share and download content, great data analytics about its listeners and since it was on its own cloud it offered a great avenue for The World to be discovered by a newer audience. Its integration with our platform, however, was a problem. 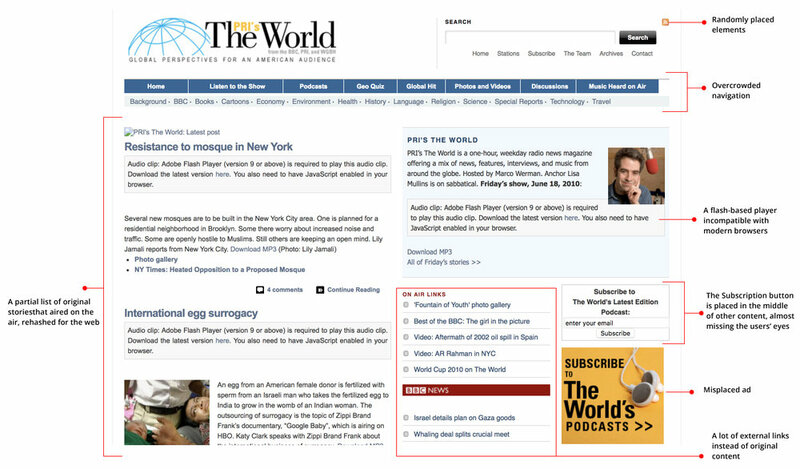 I wanted to embed the player on the home page so that users could listen to the broadcast in "one-click." I also wanted the player to be integrated in individual story pages and feeds. This meant that the player had to be used in different places in different ways and none of the few existing Soundcloud plugins offered an optimal integration without substantially increasing the production time of the web pages. So I reached out to the Soundcloud team and partnered with its platform integration team to find a solution. Our partnership proved fruitful and I was able to test the integration of the player in different web spots without overloading the production-end of the platform. Testing the design with Soundcloud was very successful and the player got a thumbs-up from everyone. The final work was to make visual adjustments to make the pages look cohesive thereby enhancing the overall user experience. I used existing brand colors to create visual separation between content categories and also to create visual hierarchy across the website. I also introduced standard image sizes across the home page and story pages to ensure a consistent visual experience for our users. The final beta version was presented to the entire newsroom and the website was made LIVE in summer 2012.